In the last session we covered the latest in launch strategies for your new Amazon product. If you have been following along, hopefully you have all of your ducks in a row and are launching your own product. If not, don’t panic as you can catch up on all of the sessions from the European leg of MDCS here. For the first part of launching we took a look at a range of tactics that you can use, and one of those included running Amazon PPC campaigns from the off. This is the strategy I am using to launch my product, Jungle Slumber, alongside running some deep discount promotions and setting up automated emails to assist in gathering some nice reviews. These sessions are only 1 hour long each, so with the promotions and emails covered in the last session, it’s now time to cover the third and final piece of my Amazon launch strategy. If this is your first time learning about Amazon Selling and would like to learn more about the process, be sure to check out our FREE course on Amazon selling: How to Sell on Amazon FBA for Beginners. 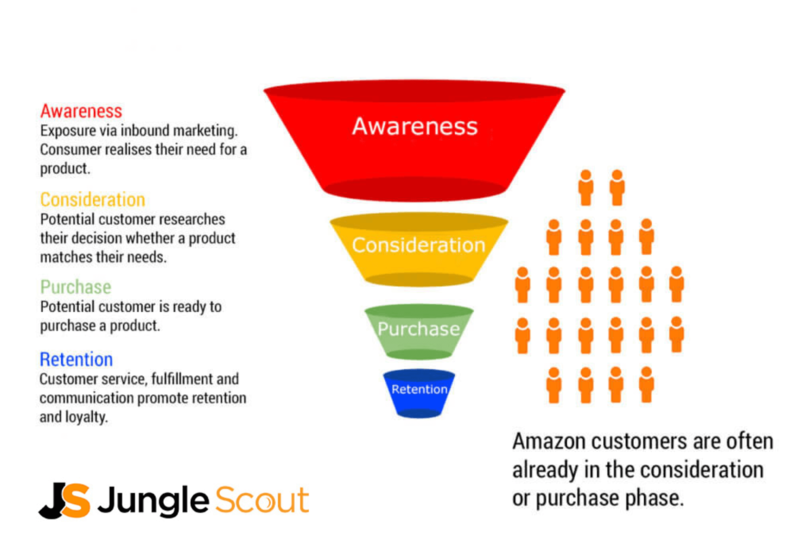 Also, make sure you check out the Jungle Scout Web App, the #1 tool to help starting sellers create their Amazon businesses. Before I get into some updates for my product, I just wanted to share some inspirational videos that I think you will love. We recently launched a series called Seller Stories, showcasing the stories of successful sellers in an honest and laid back interview with Greg. Before we get into it, I wanted to share a few product updates. As mentioned in the last session, we are unfortunately at the mercy of Amazon and Seller Support in getting our Amazon Europe account approved. This means there has been some delays, and it also means I cannot get an FNSKU yet. Whilst I am finding workarounds for this to maximize time for the purposes of this case study, if you can learn anything from my mistakes it is to set up your Seller Central account as soon as possible. Don’t wait! I had an inspection carried out by Asiainspection – the report was so thorough, and clearly shows photos and measurements covering almost every aspect of the product, comparing it to the specification. The inspection report was great overall, with only a few minor discrepancies that were easily resolved. I have placed a quote order with the freight fowarder Flexport, who are going to ship the goods even though we do not have a final destination yet (there is more than one Amazon distribution center in the UK, and I won’t know which ones my inventory is going to until I get approved and create a shipment plan). If required we can hold the goods in the UK for a while and once the account is approved, get it sent to Amazon. We will have to pay Amazon to attach FNSKU labels to all inventory as we have made the decision to ship the products now rather than wait. The photographer is ordering props for the photos (camping equipment), and should have some results to share this week. Jumping into PPC, or pay-per-click, can be a daunting for sellers who have never worked with paid advertising before. The good news is the barrier to entry is not that high on the Amazon platform, and these resources will give you all of the information you need to get started. Our main goal and priority with these campaigns is to drive traffic to our listing, generate sales, and also to generate keyword data about what actual shoppers are searching for, which will become very useful in several areas for our ongoing marketing efforts. 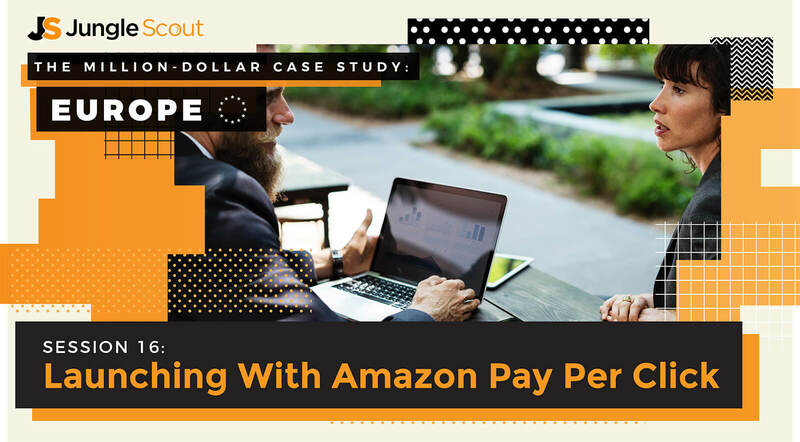 In terms of cost, Amazon PPC is one of the easiest ways to get a high return on investment (ROI) for your marketing spend. Why? Well when you advertise on Amazon, you are speaking directly to people who have entered what we call in the marketing world “the funnel” – these visitors are predominantly in a place where they are actively looking to make purchases. All this means in real terms is that when you pay for clicks on specific keywords, the people who searched for those keywords are more likely to be looking to purchase a product like yours. Don’t forget, this is a pay per click model, so you only ever pay when someone clicks on your ad, not when it is displayed (that would be a pay per impression model). Headline Search Ads are something different which can be found in another platform, AMS (Amazon Marketing Services), which you can read more about here and here. For the purposes of today we will be focusing on those PPC ads, and how you can create your own campaigns for maximum impact. There are two just different types of campaigns, and if you follow this guidance, you will utilize both when you first launch your campaigns. Here’s a quick explanation of how each works. The next step is to let this campaign run for at least a week. Be aware that Amazon’s advertising is 24-48 hours behind (always), so don’t be checking your auto campaign reports every hour expecting the sales to flood in. This takes time, and you need to let the campaign run for a while to generate data. The best idea is to leave it alone for a week, and then start checking your reports and assessing the situation. Why launch with an Auto campaign? Automatic campaigns do not allow you much control, and they put you at the mercy of Amazon, this much is true. But this is precisely why it’s useful to utilize them when you first start running PPC campaigns, and especially if you are using PPC to boost your product launch. This campaign is going to mine for lots of keyword data for you right away, and this will be according to Amazon’s own knowledge about what real customer’s want to see after scraping your product listing. It requires putting a little faith in the system, and some upfront investment. But remember, you control your maximum budgets always, and you can turn this campaign off or tune it down at a later date. Before diving into setting up a manual campaign, it’s first useful to understand a few things about how PPC campaigns are structured. This will ultimately help you to understand what information you are putting into the campaign manager, how to structure your campaigns and ad groups, and how to optimize them in the future. 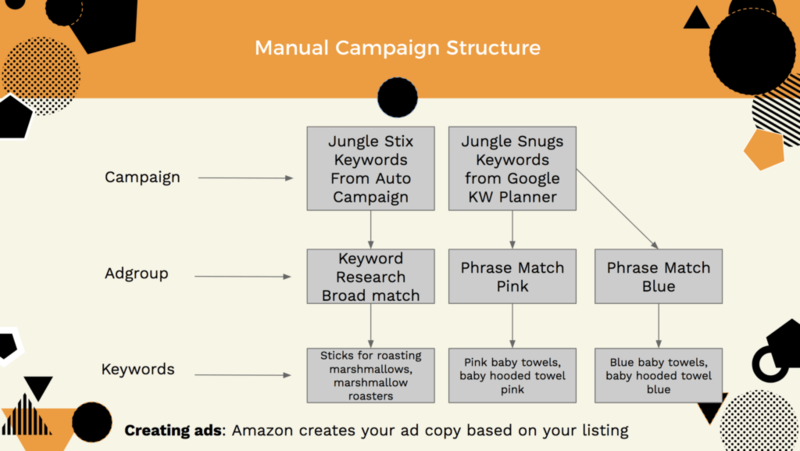 First of all, when creating a manual campaign, you will be entering your keywords yourself, unlike in an auto campaign where Amazon does this for you. These keywords can be from your own keyword research, or groups of keywords that you have found from running an automatic campaign. If you missed it, head back to Session #8 where we covered keyword research in more detail. At the top level you will have campaigns which should be logically grouped by product, campaign type, and any other defining features. For example, I might have “Jungle Slumber Manual – Google Keyword Planner”, and “Jungle Slumber Manual – Keywords from Auto”. Below this you have your ad group. This is where naming conventions come in, because you can quite easily end up with lots of ad groups, and it’s really useful to name them effectively. There are a few ways to manage ad groups depending on your preference, but for me the most sustainable for scalable growth is to adopt a granular approach. This means I will split out my keywords by match type (more on this in a moment) as well as particular themes or topics. 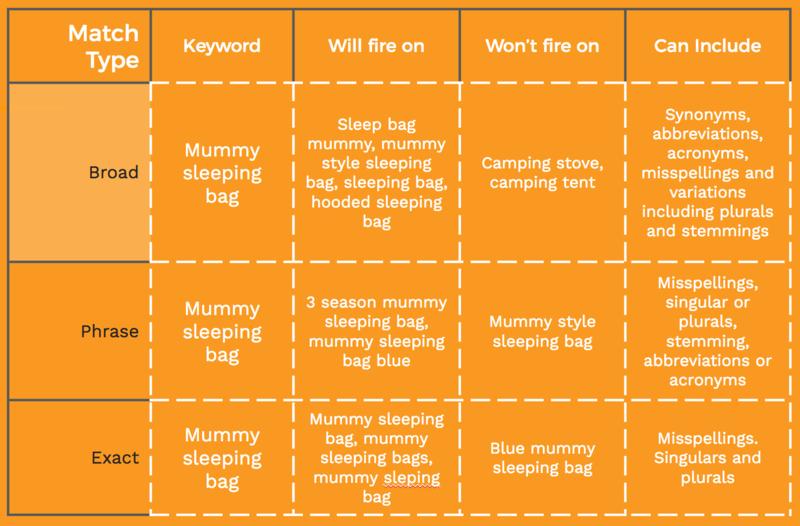 For example, “Jungle Slumber – Phrase Match – Camping”, and “Jungle Slumber – Phrase Match – Mummy sleeping bags”. This method allows me to mindfully add all of my keywords from a particular source to definitive groups, which makes it easier to look through my keywords and adjust bids. Within each campaign and each ad group sits the group of keywords and their respective match types that you are bidding on. This is also where you can tweak your maximum bids for specific keywords based on the suggested bid and their performance as a paid keyword. The next level with most PPC platforms is your ad copy. 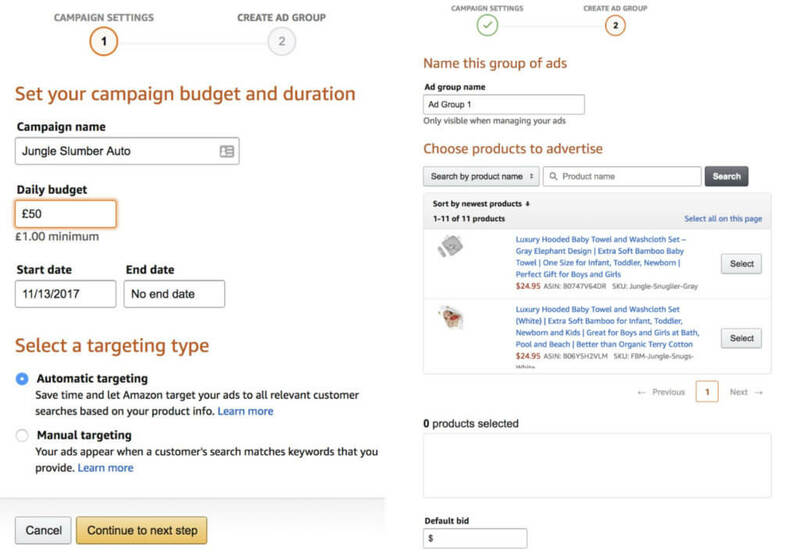 However, when it comes to Amazon PPC, this is automatically generated for you, based on your product listing. OK so now hopefully you understand how a campaign is structured and broken down. The next step is to get a strong grasp of how keyword match types work. These match types become your ultimate sidekick for testing and optimizing your campaigns for higher ROI. As you can see here, all match types account for at least plurals, singulars and misspellings. Some sellers still like to create campaigns and ad groups for misspellings, or bid on singular and plural versions of a keyword. However, this is not necessary, and at least, there is no conclusive evidence to suggest that Amazon does not in fact account for this already. One trick that Greg shares is to get a group of keywords you want to target, and put them into three separate ad groups, one for each match type. This means bidding on the same keyword three times, with a different match type. This might sound crazy – why bid three times? But the fact of the matter is, you are quickly going to be able to see which match types work best for which keywords, and adjust accordingly. Also don’t forget that you will always pay per click, so you won’t pay 3x as much per click just because you have three different match types behind the scenes. We will go into more detail about campaign management and optimization in a future session. We also have lots of resources about Amazon PPC already published on the blog. However, for now let’s just cover one of the most important aspects of reviewing your campaigns and reports: ACoS. “Advertising Cost of Sale” is how we determine our return on investment. It’s not a term/acronym that is used on other PPC platforms, but rather, it is specific to Amazon. ACoS is calculated by dividing your PPC costs by the sales generated from your PPC. That means that you divide your exact costs by only the sales that are attributed to your PPC campaigns. If you spend £10 on PPC, and get £100 of sales attributed to those ads, the ACoS would be 10%. So right now, at the point of inception – creating our first Amazon PPC campaigns, we are most interested in finding out what our “break even” point is. That means, how much can we spend per click before we break even, after which, we would start to lose money on every sale (not cool!). Tip: Greg starts to delve into some of the reports in the webinar replay at the top of the post! With these calculations, we’re simply doing some math with a few numbers that we should already know, our Landed Cost of Goods and FBA fees. 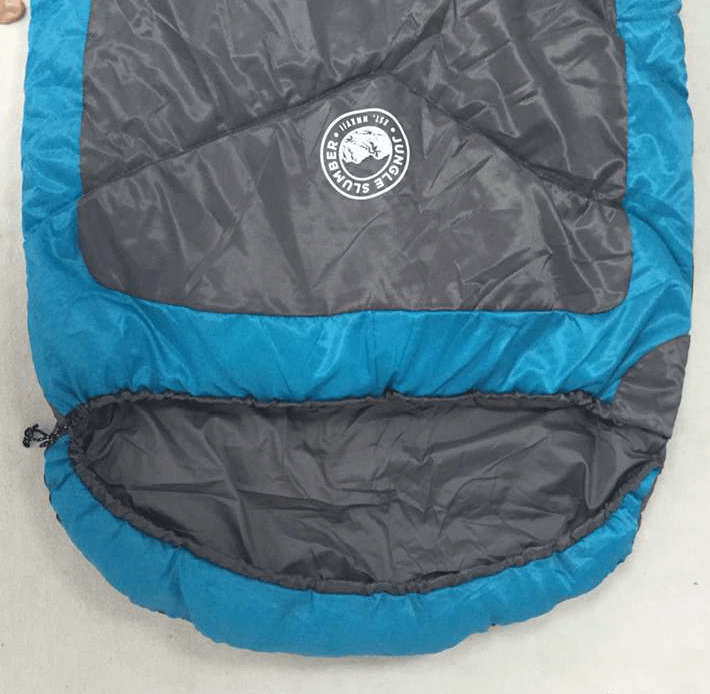 Check out this example using my product, the sleeping bags. Also remember, your pricing is subject to change. Whether it’s for promotions, pricing tests or fluctuations in future. It’s useful to do your ACoS break even calculations at a few different price points so you have it on record. Read on for this weeks homework and a free calculator to help you do this! If you are using PPC as part of your launch strategy, then you may want to be more aggressive for the first couple of weeks, and invest more money to get those initial sales. Default bids should range between £0.50 – £1.50, and you can use the suggested bids feature as a rough guideline. Remember that this is a bidding system, so even if you bid much higher than everyone else, that doesn’t mean you will always pay your maximum bid per click. For example, if the next highest bidder is at £1, and your maximum bid is set at £2, then you may only pay £1.10. As a general rule, it makes sense to bid higher on exact and phrase match than broad match keywords. The logic behind this is that you only pay more for clicks that are more specific to your product and niche. Plus, many experienced sellers predict that Amazon actually favors exact match first of all, and then phrase and broad respectively. This week your homework is to make sure you have a thorough understanding of the information shared in this session, and, when your product is ready and launched, to set up your first Amazon PPC campaigns. Remember, start with an automatic targeting campaign and leave this running for at least one week. Whilst that is working away in the background you can start to create some well structured manual targeting campaigns too. That’s all on Amazon PPC until a later session. In the next session we’re going to be covering Amazon seller profit analytics, and how you can manage the most important business metrics without spending hours in excel. Beside Amazon PPC, you also run deep discount promotions for the sleeping bag. Did you market the discount promotion on Jump Send? That’s correct and I also set up some pretty aggressive PPC campaigns. Also what impact does the number of items that are given away have on the PPC campaign? Not sure that the number of items you give away affects PPC. However, the sales you have will affect your product’s relevance, thus making it cheaper for you to purchase clicks. I have started to run a PPC campaign 7 days ago, but I have had 3 clicks on my manual ads and I am not seeing anybody making any purchases. I have had more clicks on the automatic campaign but still no conversions. I have checked my bid amount and it is competitive, I am using the suggested bid for both the manual and the automatic. Is there anything I can do to increase the click through rate, as I am not selling any products as yet? Did you do a promotional campaign prior to turning on your PPC campaigns? Yes I did run a promotional campaign but I only gave away 13 units. Should I be giving away more? If so how many units would you recommend that I give away? Historically, I’ve given away 100-200 units to start off with. Be sure to track your keyword ranking with Splitly so you don’t end up giving away too many items. Also, if it doesn’t work for the first few days, that’s okay. Usually it takes 3-4 days for Amazon’s algo to catch up. And usually it starts leveling off at around the 10th-15th day to where it’s going to rest. The formula that most recommend for the giveaway promo push is to see what the top seller is doing in your category in monthly sales use the Web App’s product tracker. Then, divide that number by 30 days. That’s the number of units you should be giving away each day for about 10-15 days. But again, make sure you’re tracking your keywords! If it’s not having an affect (possibly due to the product’s relevancy), then you don’t want to give away product needlessly. Here you mean that ppc attributed sales would not show in the campaign report, right ? if sales are happening due to ppc, they would still show up in the orders section of seller central right ? We just wouldn’t know if they were organic or ppc based, until 48h or more later? Yes, you are correct. If you make a sale via advertising, it will show up immediately as a pending order. Once the buyer’s credit card is processed and the product is shipped, it shows up as a sale (and adds to your pending transaction amount). Later, in about 24-48 hours or so, it’ll show up as a sale in campaigns. Do note, however, that ad costs are realized within one hour of click. I just want to double check if I correctly understood your guidance. 1. After I run the automatic campaign for 2, 3 weeks it is wise to let it run but reduce the budget, to add the new keywords obtained as “negative keywords” so I can obtain more data and start a new manual campaign with the same keywords using a clear name for differentiating. 2. Ongoing optimization for manual campaigns (here I refer to the initial campaign started for all three match types). 3. Start new manual campaigns using the data collected from the automatic campaign/manual ones using clear names, put the data that I’m using for this campaigns as negative keywords in the initial campaigns, so I can obtain more data from them and protect my budget. Hope all make sense for you. Thank you very much for finding time to help with my inquiries, it really means a lot to me. No problem, glad you are finding it useful. Basically, when I launch a product, I have to set up an automated PPC, and a manual one using the keywords found in the product listing research (using the same keywords for Broad, Phrase, Exact). The next step is to run this campaigns for 2, 3 weeks to obtain some relevant data and then to use this data to optimise the campaigns (negative keywords, adjust or decrees the bids). My question is, what to do with the new keywords obtained. Should I add them to the existing manual campaign or should I start a new one and stop the initial one? Or should I start a new manual campaign using the new keywords and leave the first one to run as well after optimisation. If you can provide some advice regarding this will be very helpful. Anyway, thank you very much for all this work put in this case! Honestly, it is the best learning resource for a new FBA seller. PS: hope I made myself clear enough, as English is not my first language. That made perfect sense and it sounds like you have definitely grasped how to set up your PPC here. 1. Leave the automatic campaign running on a reduced budget on an ongoing basis to find new keyword opportunities, but add all keywords in my manual campaigns as “negative keywords” in the automatic campaign. This allows the auto campaign to continue to find opportunities without draining budget. 2. Keep optimizing my manual campaigns at keyword level. When running campaigns with your keywords in all match types, it’s important to see which match types work best for different keywords and optimize accordingly. 3. When importing a new batch of keywords, I would create a new campaign (usually named by where the keywords came from and the date – e.g. keywords from auto campaign [date], or keyword research [date]). I would repeat the process above, so target all three match types with these new keywords and then optimize accordingly. And add these new keywords as negatives in my original auto campaign. Hey, my products are already selling, and some have a sales rank, so that may not be a problem i think. 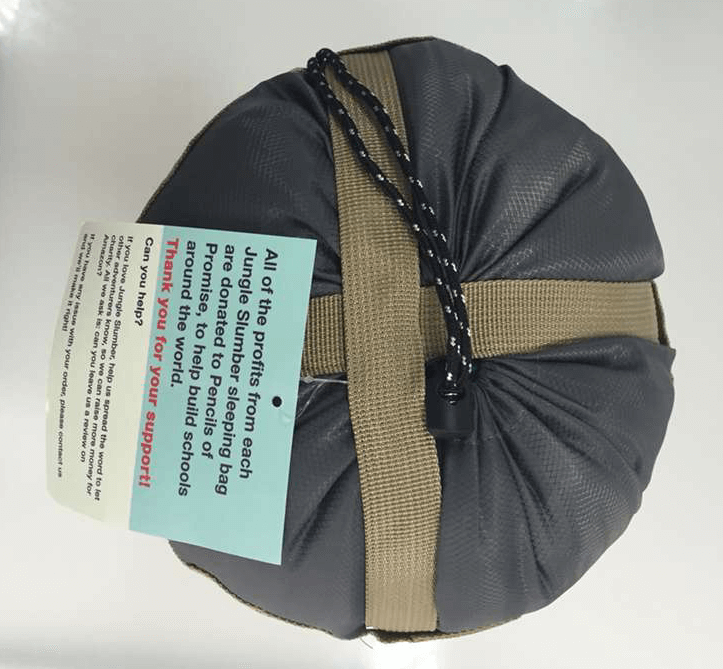 Hey Roderick – are you selling FBA or are you competing for the buy box with other sellers? If you aren’t the only seller on the listing then this could also be the reason! If that’s not the case then I would advise contacting seller support. (Sigh – I know). I have had some useful help from them recently though, I find the call back and email messaging options tend to work out well! One thing i’m missing, is if you got the PPC started directly? When i do that, i always get “Your ad is not eligible for impressions because your listing is not in the buy box.”, because it is a new product. How did you handle that? Is your inventory in stock or is it still being processed by Amazon? You cannot start running ads until your products are available to purchase by shoppers.